Up for the challenge? Closest to the hole wins in this unique golf-themed challenge! With four holes running down the center of the “green” and sand traps located on either side of the most difficult hole, try to chip your ball closest to the pin. Whether you run a competition, or simply let players “work on their short game,” this interactive game will garner lots of attention and light up the eyes of a true golf lover. Comes complete with everything you need (leave your clubs at home). 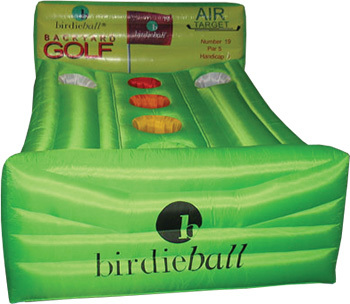 This is a perfect game to incorporate at a golf tournament, country club, or fundraiser. And for companies heavy with golf enthusiasts, you’ll want this at your summer picnic!